Despite being a relatively modern affair, completed in 1960, Tormore distillery is one of the prettiest in Scotland and its buildings have protected status. The distillery can be found at Advie not far from Grantown on Spey. The nose gives plenty of ripe tropical fruits. It is well integrated and rounded. With time some tannins and liquorice emerge adding extra dimension. The palate is fruity and creamy with playful longevity, finishing with some balancing oak. Berry Bros. & Rudd can trace its origins back to 1698 when the Widow Bourne founded her shop opposite St James’s Palace. Today, the present generation of Berrys and Rudds continue to manage the family-owned business from 3 St James’s Street. 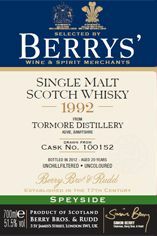 Tormore is a relatively young Speyside whisky distillery, founded in 1960 primarily to produce whisky for use in Long John blends, and soon after the Tormore malt was also used among Ballantine’s blends. In 1991 Tormore was one of the whiskies included in the ‘Caledonian Malts,’ alongside Glendronach, Laphroaig and Miltonduff. Tormore produces a few distillery bottlings, including a 10yo, 15yo and Cask Strength malt. Other independent bottlings are more commonplace. There is a time capsule buried in the forecourt of the distillery which is meant to be opened in 2060, and it contains, among other things, a tregnum of Long John blend, which, after 100 years of aging, should be a formidable drink for the person lucky enough to unearth the capsule.